The 25-year-old recruit suffered much psychological deterioration while serving in the army, forced to obey his officers, even though he was longing to join the revolution. At the beginning of the revolution, if someone in predominantly pro-regime rural Jablah took a stroll outside at night, they would’ve spotted a car gently cruising the streets, stopping next to a wall, or a sign with Asadist slogans. A young man would get out, his face covered, spray on it, then leave quickly. One could run into him in front of a school, an official building or a park, where he would spray words like “Freedom, Revolution, the People Want to Topple the Regime”. That young man was called Ayman Sulayman, and he was killed in an armed opposition offensive in Aleppo on Monday the 1st of August 2016. After his graduation from the Petrochemical Engineering Faculty of Homs University, he had an opportunity to continue his studies in Ukraine as the revolution started in 2011. However, Ayman decided to stay in Syria, after visiting his friends in Homs, who took him to the first demonstrations there. He returned to his Alawi village in rural Jableh with a new feeling, he had turned completely against the regime, and wanted to take fully part in the revolution. Ayman’s activism started with his cousin, and his car. Their plan to avoid being arrested at the numerous regime checkpoints in the Jableh countryside was to place a fake plate number on the car, in case the security forces manage to film it. Ayman was thus able to move between the villages of al-Baraʿim, al-Barazin and az-Zahra' with his canisters. 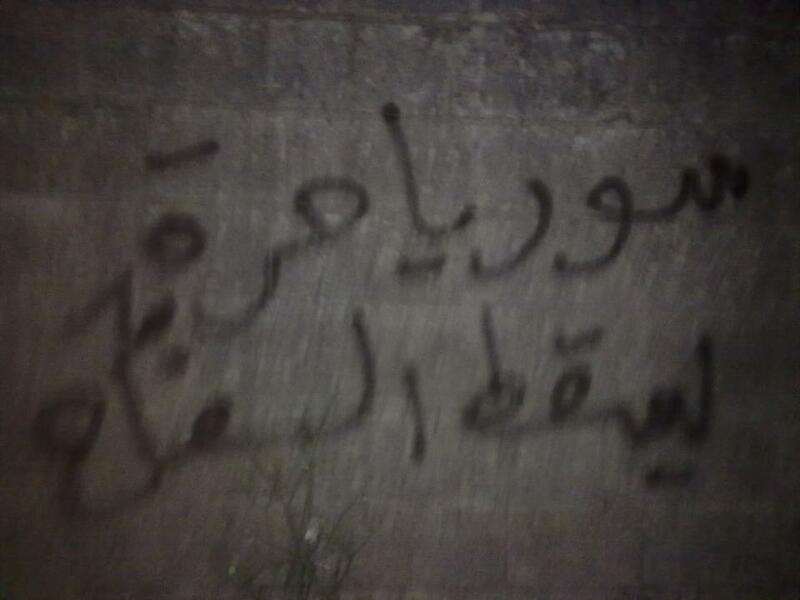 Graffiting was widely spread at the beginning of the revolution, especially in Idlib, Homs, Banyas and Damascus, where activists would write anti-regime slogans on walls and shop gates. Between 2011 and 2013 Ayman’s work increased on those villages’ walls, while the security forces were never able to catch him. Because he lived in a pro-regime environment, his work required courage and care at the same time, so he never signed his graffiti, which kept up to date with the events of the revolution. For instance, when the famous opposition figure ʿAbdul-ʿAziz al-Khayr was arrested in October 2012, he wrote “Freedom for ʿAbdul-ʿAziz al-Khayr, and Shame to the Imprisoners”, and when security forces beat up protesters in al-Bayda' (April 14, 2011), nearby Banyas, he wrote “Husayn weeps Banyas, You Are a Thousand Karbala'”, drawing a comparison with the local Alawi religious tradition of mourning the martyrdom of Husayn in Iraq's Karbala' (680 AD). People would wake up every morning to such slogans on the walls of their villages, wondering who did it, and patrolling the roads in vain. After graduation Ayman had took up working in family farm, which was one of his favorite hobbies. He would spend hours on the land taking care of olive trees and tobacco plants, but he was wanted for the draft, and had no excuse to bail out of it. Being from a poor family, he could not afford to flee Syria, so he had to join the army in April 2013, when he was sent to an-Nabak in the northern countryside of Damascus. [Photo: A slogan written by Ayman in rural Jablah. It reads “Husayn weeps Banyas, you are a thousand Karbala'” (SyriaUntold)]. In addition to the troubled financial situation, the political position of his family was very sensitive, because Ayman’s father had been arrested in 1987 for joining the Communist Action Party (CAP), and only released several years later. Therefore, Ayman couldn’t join the armed opposition in fear of repercussions against his family. The 25-year-old recruit suffered much psychological deterioration while serving in the army, forced to obey his officers, even though he was longing to join the uprising. After three years of torment, in 2016, he was transferred to Aleppo, as a lieutenant in charge of an infantry division. He was only allowed a short leave to see his family earlier this summer, when they realized that his face had aged two decades in those draft years. Then he returned to Aleppo, and remained there until the regime enforced a full siege on the city on July 8. 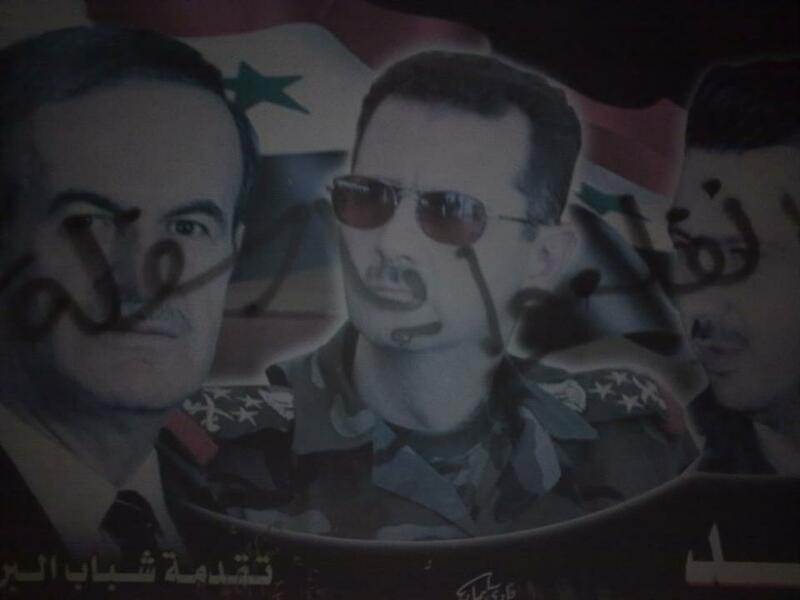 [Photo: One of Ayman's graffiti on a poster that depicts the Asad family in rural Jablah. 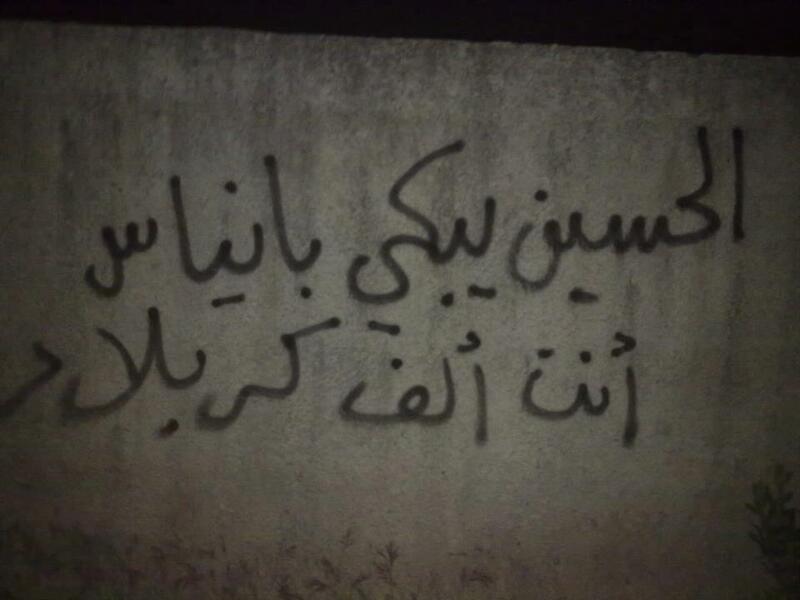 It reads “Get Out You Varmints” (SyriaUntold)]. Around one month later, opposition factions announced the Greatest Aleppo Battle in order to break the siege. Ayman was in a regime army building that was shelled on the 1st of August, killing everyone inside. In his village, his family held the funeral, even though they had not received his body. The army told them it was burnt completely in the attack. So Ayman vanished, but his revolutionary graffiti remained on the walls of the Jablah countryside. This story was related to SyriaUntold by Ayman’s relatives, requesting his real name be withheld for their safety. [1st Photo: A slogan written by Ayman on the walls of the Jablah countryside. It reads “Freedom for ʿAbdul-ʿAziz al-Khayr, and Shame to the Imprisoners” (SyriaUntold)].